Oh, Mr. Holmes... I'm honestly not sure how to feel about this movie. On the hand, it's a fascinating concept with an excellent cast. On the other hand, I don't think it quite really lived up to it's potential. Basically, in 1947, Sherlock Holmes is 93, retired, living in the country in Sussex on a farmhouse where he keeps bees. He lives with his housekeeper Mrs. Munro and her son Roger. As the movie opens Holmes is coming back from Japan, where he had gone to obtain the prickly ash plant, which, when converted into a jelly, he hopes he will improve his failing memory so he can recall the details of his final case- the real details, since he was somewhat unhappy with Dr. Watson's fictionalization of it, The Adventure of the Dove Grey Glove. He can't quite remember what happened with the case, but he knows that whatever happened, it caused him to retire from the detective business and move to the country. The prickly ash begins to kick in and Holmes begins piecing his last case together. 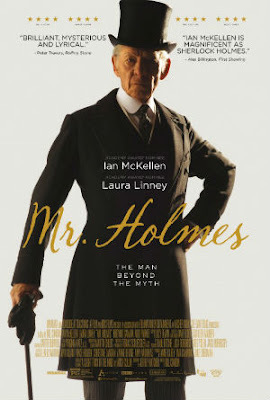 Just after the end of the First World War and the departure of Doctor Watson from Baker Street, he is approached by a man named Thomas Kelmot who is struggling to understand why his wife Ann has changed so drastically after two miscarriages Holmes follows her through London and eventually deduces that Ann is buying two headstones for her lost children, one for herself and some poison she can commit suicide with. Confronted with that fact, she pours the poison out in front of Holmes and after asking if they could share the burden of loneliness together- Holmes declines and she leaves. Another flashback emerges- this time of his recent trip to Japan, where he meets an admirer, Mr. Umezaki, who helps him find a prickly ash plant at Hiroshima. His father had abandoned him and his mother years ago- apparently writing a letter saying he was so impressed with the legendary Mr. Holmes that he had decided to stay in England forever. Holmes tells Umezaki that he had never met his father and his father probably wanted a new life for himself in England, which disappoints Umezaki. Woven in between these flashbacks, we see Holmes' health beginning to deteriorate more and Mrs. Munro is starting consider other options for herself and her son- eventually accepting a job offer at a hotel in Portsmouth and planning to leave and take Roger with her. Roger, for his part is dissatisfied with his mother's lack of education and working class status and wants more for himself and this causes a great deal of tension between mother and son- which is exacerbated when they find Roger unconscious near the house a victim of multiple stings and he is rushed to the hospital. Holmes stops a distraught Mrs. Munro from destroying the bees, realizing that Roger had discovered the wasps' nest that was killing the bees and, having attempted to drown it, was a victim of a wasp attack and not the bees. We also find out that after Mrs. Kelmot leaves, Holmes discovered that she had killed herself anyway by standing in front of a train. And Mr. Umezaki's father, it turned out, had gone to work for MI-6 in secret and had served the British Empire honorably for many years- which Holmes remembers and send in a letter to Mr. Umezaki. As Roger recovers, Holmes reveals to Mrs. Munro that he his deeding her the house and the grounds after his death, encouraging her to stay instead of pursuing another job in Portsmouth. As the movie ends, Holmes is seen placing stones in a ring to remember to loved ones he has lost over the years. I really really wanted to like this movie. I really did. The idea of Sherlock Holmes as a real person/detective- divorced from the fictionalized version and somewhat irritated by the attention is a fascinating idea. The idea of an old Holmes trying to piece together one last case before he dies? Equally awesome potential. But for whatever reason, this just didn't quite come together for me. Don't get me wrong: it's a good movie- Ian McKellen is excellent in whatever he does and his portrayal of both the aging Holmes and the Holmes of thirty years prior seen in the flashbacks is excellent. Laura Linney plays the part of Mrs. Munro well, but her working class accent seemed... inconsistent, which is surprising, but it bothered me. I wasn't really sure what she was going for with it. Overall: I felt like I was expecting more than I got out of this movie, but maybe that was the point. Maybe aiming for 'the man beyond the myth' like the posters said produces something less dramatic and more mundane. Me: *** out of 5, The Missus: needed sleep, which meant she probably made the better choice here.